Located on the Gulf Coast, Galveston, Texas is the pinnacle of business and pleasure. From sandy beaches to historic strands, this ocean-themed town invites guests of all backgrounds to enjoy some fun in the sun. Because the Port of Galveston is a main source of economic revenue, the island serves as a great center for not only cargo operations but also as a large cruise terminal. With a 2.3 billion economic impact supporting 13,892 jobs and including over 1,730,289 cruise passengers to date, the Port of Galveston is a place of work and vacation (Port of Galveston, 2017). Tourism generates a great amount of the economic impact for Galveston overall with ranking #1 on the Gulf Coast and #4 in the nation for cruise ports. With such a large port for travel and the many beachfront hotels/condominiums, Galveston thrives as a tourist destination. People from around the world come to partake in the city’s attractions such as Moody Gardens – a nature, aquatic and wildlife educational exhibit with three pyramid attractions and hotel, The Strand – a historic neighborhood filled with vintage parlors, diners and more, Pleasure Pier – a small amusement park on the water, and countless other museums, restaurants, and beaches. Healthcare facilities such as the University of Texas Medical Branch (UTMB), one of the largest teaching hospitals in the state, and Shriners Burns Hospital at Galveston, a medical center offering acute burns care, also support the island’s economy. From patients to doctors to medical students, these hospitals provide great resources to those on the coast as well as all over the country. 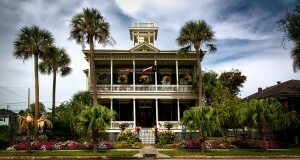 Once as the capital of the Republic of Texas, Galveston has a rich and animated history. If you grew up in the United States, especially in Texas, studying the unforgettable 1900 Great Storm came as a rite of passage. But the island is not only notable for this well-known hurricane. Monuments such as The Grand 1894 Opera House, The Galvez Hotel, The Seawall and more keep Galveston rooted in its deep yet beautiful history. The Strand National Historic Landmark District is another popular part of town that brings the past to life. With Victorian era buildings to ice cream and candy parlors such as La King’s Confectionery, the Strand is an entertaining area right out of a Dicken’s novel. If you visit in the winter, you’ll want to check out Dicken’s On The Strand, an annual holiday street festival! From past to present, it is clear that businesses, landmarks and neighborhoods are here to stay in Galveston. The oldest continuously printed newspaper in Texas since 1842, Galveston County Daily News, is still one of the leading news publication in the state. Many businesses like these in the city have a story, a history, and a strong following of dedicated residents and tourists. Up and down these historic streets, small businesses flourish among the palm trees and beach waves. From clothing boutiques to breweries to mom and pop diners, Galveston offers a great environment to start your company. The combination of location, community, and business creates a supportive environment to prosper. If you’re looking for a way to manage your business or in the first stages of creating your own in Galveston, have Halloo help you keep track of your customer’s and employer’s needs. With Halloo, you can manage your company from this island city or anywhere and stay on track with your team. Find a Galveston area phone number for your business. To search numbers available in area code 409 click here. This entry was posted in Local phone numbers and tagged Galveston Phone Numbers by Kathryn Anderson. Bookmark the permalink.